Huckabee is going after Pelosi over the CIA controversy. WASHINGTON (CNN) - Mike Huckabee has apparently found his muse: Nancy Pelosi. Huckabee penned a poem about the House speaker, who has come under fire from the GOP for accusing the CIA of lying to her in intelligence briefings about the agency’s use of harsh interrogation techniques. Huckabee calls Pelosi a “ruthless politician” and tweaks the San Franscisco Democrat for her use of a military plane for travel back to her district. She sat in briefings and knew about enhanced interrogation; But claims she wasn't there, and can't give an explanation. She disparages the CIA and says they are a bunch of liars; Even the press aren't buying it and they're stoking their fires. 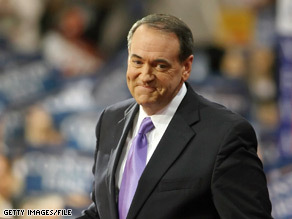 Huckabee is clearly not presidential material. And the pathetic Republicans are clearly trying to deflect blame from Cheney's crimes by focusing on Pelosi, which is because they are complicit in Cheney's crimes. I second your comment. John King every Sunday seems to interview a lot of Republicans and never asked them do they feel knowing about torture is worst then actually doing the torture? YAWN!!! They're grasping at straws. Can we move on please?!!! Who cares. Get to real issues like healthcare reform. Well at least he found something that he might be good at. Someone is bored. As a Democrat I say investigate ALL of them. If Pelosi lied then she should be held accountable. BUT, I do find it ironic that the same people who are screaming for Pelosi's head aren't screaming for Cheney's, Bush's, Rumsfeld, Rove and all the rest. Let us assume that Pelosi is lying. What's worse, lying or approving torture? I'd saying approving torture. The GOP is using Pelosi as distraction for the fact that they lied and tortured people.